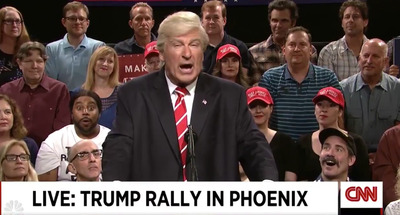 Alec Baldwin reprised his parody of President Donald Trump in a sketch depicting Trump’s raucous Phoenix, Arizona, rally. Baldwin’s Trump opened the sketch lamenting about the fallout surrounding the white nationalist rally in Charlottesville, Virginia. Baldwin’s caricature of Trump then tore into “the dishonest media” that reported on his scripted speech of the US’s future strategy for Afghanistan. “What do we want,” Baldwin asked. “The wall,” the mock crowd chanted. “Who’s going to pay for it,” Baldwin asked again. “Mexico,” the mock crowd chanted back. “That’s right, you are, the American taxpayer,” Baldwin said.